Cologne, Germany, on April 24, 1945. 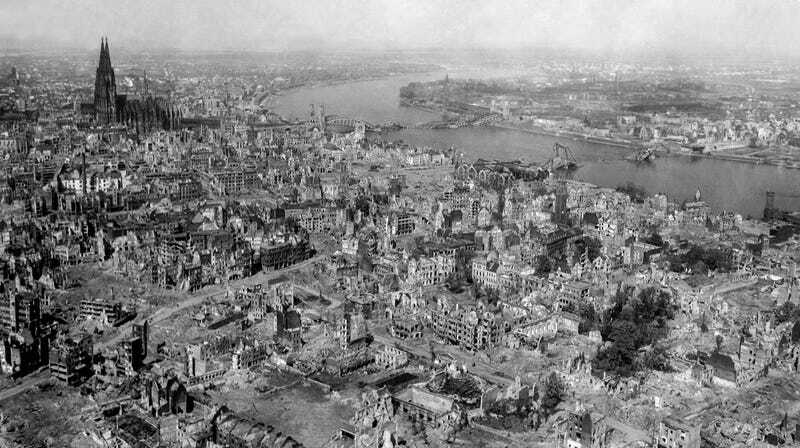 As if the devastating effects of bombs dropped on European cities during the Second World War weren’t terrible enough, a surprising new study shows that the shockwaves produced by these bombing raids reached the edge of space, temporarily weakening the Earth’s ionosphere. Large Allied bombing raids during World War II produced shockwaves powerful enough to briefly reduce the concentration of electrons in our planet’s ionosphere, according to new research published today in the science journal Annales Geophysicae. This weakening occurred above the bombing sites, and as far as 600 miles (1,000 kilometers) away, according to the new research. The effect was both temporary and not dangerous, but a weakened ionosphere—the layer of the Earth’s atmosphere that is ionized by solar and cosmic radiation—could have interfered with low-frequency radio transmissions during the war. Artist’s depiction of the ionosphere, shown in purple (it’s invisible to the naked eye). The integrity of our ionosphere, a thick band that sits 50 to 360 miles (80 to 580 kilometers) above Earth’s surface, is heavily influenced by solar activity, including phenomena such as coronal mass ejections, high-speed solar wind streams, and energetic particle events. Today, disturbances to the ionosphere affect technology such as radio and GPS. But the effects of bombing raids on radio communications made during WWII remain poorly understood. While the bombing of London by the Luftwaffe between September 1940 and May 1941 (popularly known as the “London Blitz”) would have generated explosions at a closer proximity to the ionospheric measurements being made above Slough, this bombing was more or less continuous, making it difficult to separate the impact of wartime raids from those of natural seasonal variability. At the same time, the four-engine planes used by the Allies could drop much heavier bombs than the twin-engine German planes. Thus, the Allied bombing raids were both stronger and more discernible, making them a more useful variable to study. Bombing of a factory at Marienburg, Germany, on 9 October 1943. Looking at the daily reports collected by the Slough station, Scott was able to document a series of frequent radio pulses over a range of shortwave frequencies. These reached as high as 100 to 300 kilometers above the Earth’s surface. In addition to height, the data also revealed the electron concentration of ionization within the upper atmosphere. Scott and his colleagues then analyzed the ionosphere response records that corresponded to the timing of 152 large Allied raids in Europe, in which 100 to 900 tons (220,000 to 1.8 million pounds) of explosives were dropped onto cities, factories, and other military targets. Looking at the data, Scott could see that electron concentration in the ionosphere “significantly decreased” due to the shockwaves caused by the bombs. The powerful shockwaves heated the upper atmosphere, causing the loss of ionization, the researchers say. Normally, a temporary reduction in the concentration of electrons is caused by the Sun, but it can also be caused from below, namely from lightning, volcanic eruptions, and earthquakes. The new study shows how modern warfare is a force of nature unto itself. As the researchers point out, one metric ton of TNT has an explosive energy equivalent to a single lightning strike. Patrick Major, a co-author of the study and a historian at the University of Reading, said the strength of these bombs wasn’t lost on those who were there to witness it. At a more philosophical level, this study presents a potent reminder of how powerful our military technologies have become. War, as it has been said so many times, is hell.